University of Illinois alumni are prominent among this year’s finalists for the nation’s oldest state sustainability award. Here are some of the homegrown environmental champions who are making their commitment to environmental sustainability count in their careers. Julie Cahillane (BA ’89 Speech Communications) has been helping Northwestern University develop its environmentally friendly operations for more than two decades. Over more than two decades, Julie Cahillane (UI ’89) has served as both witness and counselor to the emergence of a new societal paradigm – sustainability. When she became recycling coordinator at Northwestern University, sustainability, in the sense of human sustainability on planet Earth, had scarcely pierced the lexicon. “As environmental initiatives became more of a focus at Northwestern, I continued to drive sustainability efforts at the institution,” said the speech communications major who today serves as Associate Director for Sustainability at Northwestern. Last year Northwestern took the ultimate step of institutionalizing its commitment to lightening its environmental footprint with its first Strategic Sustainability Plan (SSP), which helped make it a winner of the 2018 Illinois Sustainability Award announced in Chicago on Oct. 23. The commitment of a major research university to carbon neutrality, which was outlined in the plan, produces many ripples affecting the lives and behaviors of students and the rest of the enterprise. Beyond that, Northwestern is a potent economic engine, which through its contract requirements for services can help make economical ‘green’ options (e.g., composting) available to the greater community. Recognition like the Illinois Sustainability Award supports the university’s ability to share best practices with others and engage the campus in greater understanding of the importance of our sustainability initiatives, said Cahillane. Over the years, she has found that incremental changes, balancing each individual’s personal priorities with their understanding of their individual impact on the planet, is the key to progress. 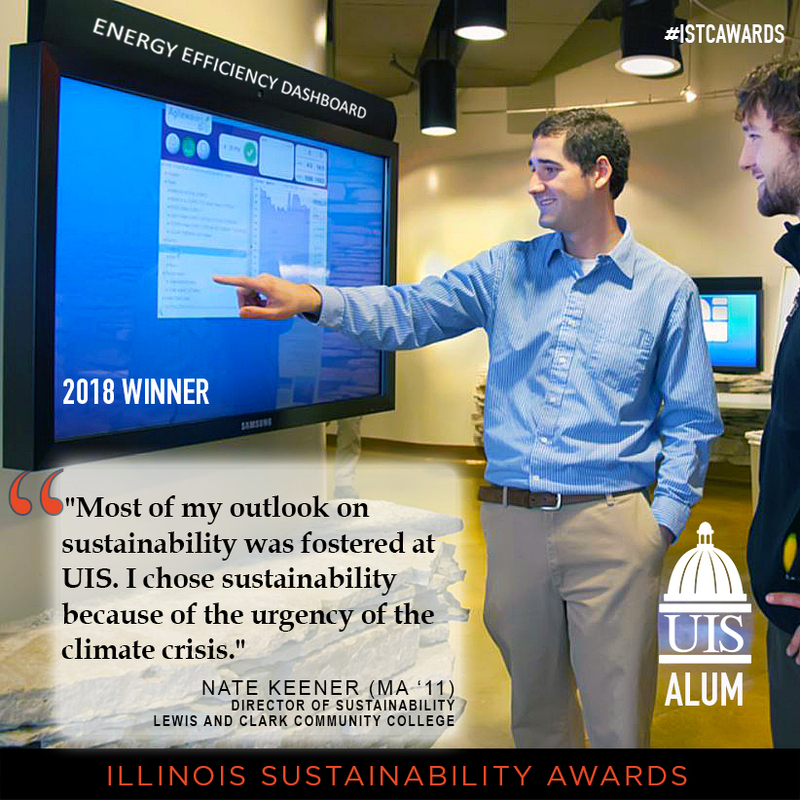 A mind for figures, and a Master’s in Environmental Studies – Sustainable Development & Policy from University of Illinois, Springfield, combined to help make Nate Keener (’11) and his employer, Lewis and Clark Community College, a sustainability leader in the greater Saint Louis area. A worldwide calamity led Nate Keener (UIS ’11) to take refuge as a graduate student at the University of Illinois at Springfield. There he devoted his time preparing for an even greater global crisis— climate change. As the Great Recession of 2008 shattered the job market through the early 2010s, Keener completed a Master's degree in Environmental Studies – Sustainable Development & Policy. Today, as Director of Sustainability at Lewis and Clark Community College, he leads a robust program to become carbon neutral by mid-century. These efforts have made Lewis and Clark a winner of a fourth Illinois Sustainability Award. Award winners were announced Oct. 23 in Chicago. The underlying goal of the college’s sustainability plan is to model sustainable practices. On-campus efforts are designed to make an imprint on future leaders. The College also collaborates with local, regional, and national partners like the St. Louis Green Business Challenge, the Illinois Green Economy Network, the Midwest Renewable Energy Association, and the U.S. Green Building Council to broaden their impact. The college also engaged with efforts to make group buys of solar panels in nearby Glen Carbon, Godfrey, Madison County, and the greater St. Louis area. Keener found UIS and sustainability was the right fit for his passionate advocacy. On campus he found rich opportunities for science, practical learning and service. There he became President of Students Allied for a Greener Earth and served as a panelist during a global recycling summit. Through UIS’ Graduate Public Service Internship Program he served as a Water Quality Compliance Assurance Officer at the Illinois EPA. At UIS, “I learned the science behind climate change, recycling, renewable energy, ecology, and a whole host of information about what it will take to transform our world into something more sustainable,” he said. Mundelein Municipal Management Analyst Jonathan Kellogg (’20) said his work on an a U of I online Master of Human Resources and Industrial Relations program will be an asset as he guides the development of the Village’s sustainability plan. With the construction of its new LEED Gold certified Village Hall in 2014, environmental sustainability has remained a core focus of the Village of Mundelein’s operations, services, and policies. Since then, the Lake County municipality has been continuously implementing green initiatives and programs. The village is in the process of developing a formal sustainability plan, to be coordinated by Management Analyst Jonathan Kellogg (’20), a current graduate student in the University of Illinois’ Master of Human Resources and Industrial Relations (MHRIR) program. “In my first class for the MHRIR program, sustainability was an important focus, and I have been able to lay a solid academic foundation to my professional approach to sustainability at the Village of Mundelein,” said Kellogg. “Sustainability has become a priority of the Mayor, Board of Trustees, and the Village Administrator,” Kellogg said, and the village’s achievements have earned it a 2018 Illinois Sustainability Award announced in Chicago on Oct. 23. As a municipal management analyst, Kellogg is involved with numerous aspects of Mundelein’s sustainability commitment, from drafting policies and tracking results to working with the local business community on green initiatives. According to Kellogg, the people of his village have a certain expectation that village officials and local businesses take the environment, efficiency, and fiscal and social responsibility seriously. “What our institutions do today will determine what kind of future our children and grandchildren will have with regards to the environment, economy, workforce, and society itself,” he explained. Mundelein has completed LED lighting retrofits, upgraded water reclamation facility efficiency, provided public electric vehicle charging, banned the sale of phosphorous fertilizers, included environmental impact in vendor selection, and is currently looking into solar panel installation for some of its facilities. “As I progress through the MHRIR program and grow in my profession, I will continue to view my responsibilities and activities through the lens of sustainability,” said Kellogg, who also holds a Master of Public Administration (MPA) from Northern Illinois University. Patricia Ham (’09) and her colleagues at Mount Prospect’s Public Works Department try to be a model for what a small village can achieve in sustainable waste reduction. When Mount Prospect Mayor Arlene Juracek learned of the Illinois Sustainability Award she asked Administrative Analyst Patricia Ham (UIUC ’09 BS-Kinesiology) to gauge the village’s chances. It was 2017, Mount Prospect’s Centennial Year, and the village was looking for opportunities to strut its stuff. Ham decided to write a nomination application knowing the village offers a vast amount of recycling resources for the residents. It turned out that Mount Prospect and its Public Works Department has been growing a Solid Waste Reduction program that any town would be proud of. That has made the village a finalist for its first Illinois Sustainability Award, which will be announced in Chicago on Oct. 23. For years they have been getting great service from their waste hauler and valuable ideas from the Solid Waste Agency of Northern Cook County. By 2017 the village, located near O’Hare Airport, was offering free, unlimited curbside leaf and yard waste pick up. (Bagless leaf sweeping has proved particularly popular.) Yard waste collection was expanded to allow food waste. Then residents were given free recycle bags for used clothes, shoes, accessories and the village encouraged them to also include silverware, dishes, toys and other items. They also host recycling events for seasonal trash (e.g., pumpkins, Christmas trees) but more than ten years ago Mount Prospect began an in-house program to accept many additional hard-to-recycle items year-round at its Public Works facility. Here is where sustainability advocates’ eyes start to grow round. Whenever a citizen of Mount Prospect finds him- or herself saddled with unwanted medicines, medical sharps, household hazardous wastes and chemicals, compact florescent lights, mercury-containing waste, household batteries, or plastic grocery bags, they can deliver them for recycling with no delay. Electronics are also accepted weekly. That is not all. The village works hard to make sure citizens take advantage of these services through leaflets, reports, and monthly meet-and-greets. Their 2017 annual open-house attracted more than 3,000 residents. And what other small village can boast a yearly haul of 1.5 tons of holiday lights for recycling? Ham explained that this ethos runs deep in the organization and the goal is to be a model for others, to prove that with community participation such achievements can be easy. “We want to show that it is without a doubt going to positively affect emerging generations and make an enormous difference in our world,” she concluded. The 2018 Illinois Sustainability Awards were presented October 23 at the Union League Club in Chicago. Illinois companies, communities, and organizations have been vying for the ISA, one of the earliest programs recognizing sustainability achievements, for 32 years.